I start by cooking bacon (I cut small bite size pieces) with my kitchen scissors into small pan with lid. This makes for less mess and makes bacon crispy. Then while bacon is cooking I whisk eggs together with chives then I add artichoke hearts cute in 1/4 pieces with spinach. Next I drain bacon on a paper towel and set aside. I start cooking the egg mixture on medium so that it starts to set but doesn’t burn bottom. Before mixture gets too hard add the bacon pieces to it. Then be patient and let it cook and bubble on top. While it is cooking move the pan around to distribute loose egg on top to cook. 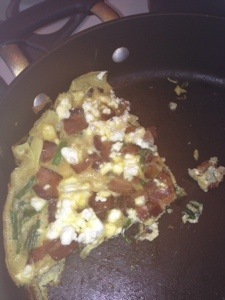 Once you are sure eggs are cooked on top add the goat cheese on top and let melt. My theory is everything tastes better with goat cheese. Then cut in 4 quarters and serve. Hope you enjoy and happy new year!